Top 3 Benefits of an Open House! Often times, when selling a home, your agent may suggest that they host an Open House. There are quite a few reasons why an Open House is a great thing for your newly listed property. However, we are going to zeroin on the three major reasons for now. GAIN ADDITIONAL EXPOSURE: We believe this to be the top reason why holding an Open House is a great thing. When you first list your home, you typically get quite a bit of exposure right off the bat. However adding an Open House can increase the excitement, the curiosity, and bottom line, the amount of exposure your home will get. While an Open House is not guaranteed to "sell your home", it can certainly help get people in the door. REMOVE THE FEELING OF PRESSURE: Whether potential buyers are just starting out in the house hunting game or are seasoned and waiting for the right property to come along, there may be a sense of pressure that you can help relieve. Having the right Real Estate Agent representing you (Buyer, Seller or Both sides) can certainly make understanding the process, going through the process, paperwork, and more much smoother, however, we are human and we have feelings. It can be common, especially for Buyers to feel a sense of pressure in the home buying process. What do they want in a house? What can they afford? What if their offer doesn't get accepted? What if they want to see the house without the pressure of a private showing? THIS IS WHERE YOU COME IN! Open Houses create a pressureless, free-flowing feel of house hunting. While everyone that walks through the door at an Open House is not a guaranteed buyer for your home, you most likely increase your odds. If they really like it - trust us they will schedule a private showing to view it again. The Open House gives them almost a "preview" before they commit and dive in with a personalized showing, inspections, etc. START THE PROCESS: While we highly suggest anyone looking for a home meet with a Buyer's Specialist beforehand. Many first time buyers are not fluent in the home buying process. What do they do first, do they go to an Open House, talk to a real estate agent or a bank first? A buyer's specialist will eliminate all of those questions, and explain the process through and through. For those who are unfamiliar, they are more apt to see an Open House sign pointing in your direction and take a leap and stop in, which then can lead to meeting the agent showing your property, understanding the process to possibly being your potential buyer. Take a moment. Look at our top 3 reasons to host an Open House backward. Going from 1,2,3 or 3,2,1 has a huge effect on each other either way you look at it. Your Open House can start the home buying process for someone. 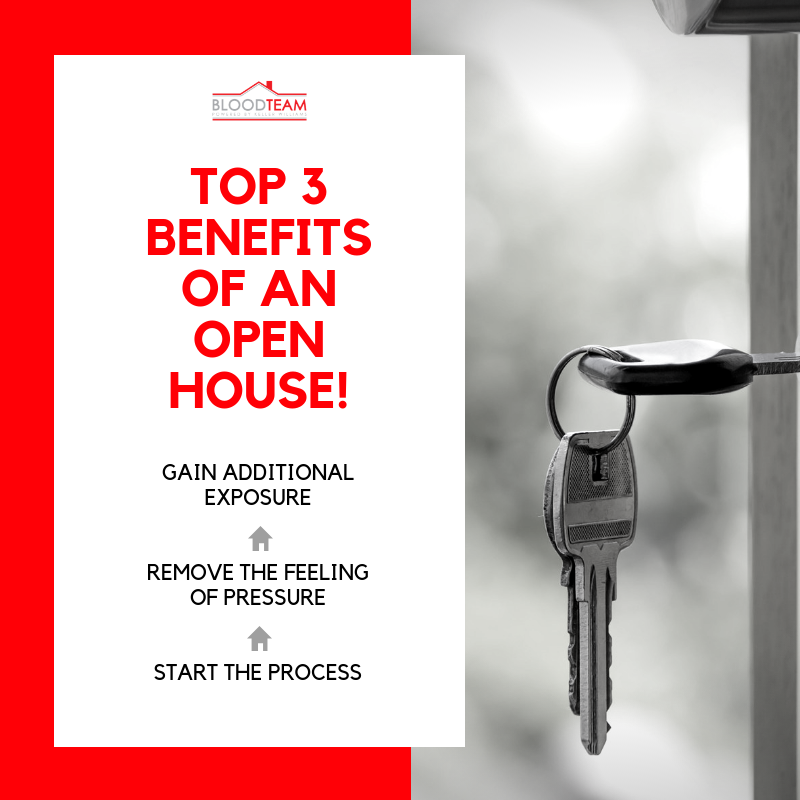 Starting the process and having an Open House can certainly relieve some of the "buyer pressure", and lastly the more home buying processes you start, the more pressure you relieve, which can lead to additional exposure for your home. Final thoughts... Selling your home starts with exposure. In order to have that, you need a marketing plan, whether or not an open house is scheduled. Find out why were are the most preferred local real estate agent in the area and why our marketing plan has stood the test of time throughout the market changes.